I think I'm back to blogging and creating products on a regular basis now. This back to school season was so busy that I had no choice but to put blogging on the back burner for a while. I do apologize! I promise to make it up to you guys with many great freebies on the way :) Speaking of FREEBIES, be sure to scroll read to the end of this post to download my newest freebie. Have you seen the wonderful giveaway going on over at Dots of Fun? Tammy recently reached 700 followers! In order to celebrate this milestone, she is hosting a HUGE Giveaway! Tammy plus 8 of her fellow artists have combined some of their best products into a great giveaway prize. 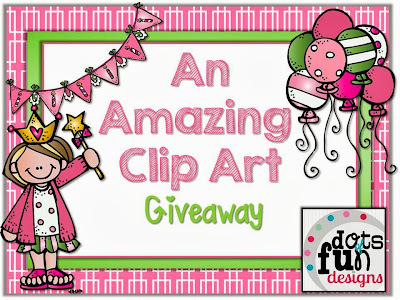 Click the picture below to enter An Amazing Clip Art Giveaway! Many school districts in my area just recently adopted EngageNY (including the school where my sister teaches) in order to teach Common Core Math Standards. After talking to my sis one afternoon I learned about having to teach students to count the "math way." A few days later I was browsing some of my favorite clip art shops on TpT when I came across Kinder Alphabet's Math Fingers Set. 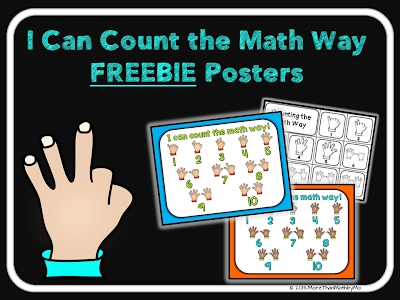 I automatically thought about my sister and decided to create an activity and poster set to help students get the hang of counting the "math way." I am almost finished with the entire set, but while waiting I decided to give you guys a few of the posters for free. Click the picture above to download this freebie. I hope you enjoy them! I'd love to hear your feedback here and/or on TpT. Thanks for stopping by today! Keep your eyes on my FB Page tomorrow if you like freebies. Thanks so much for the shout out!!! Email me so I can email you a thank you gift!!! !